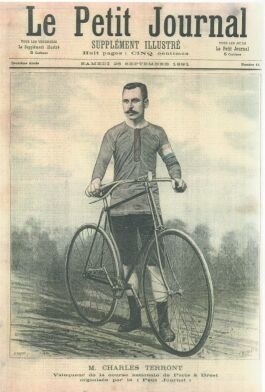 The success of the Bordeaux-Paris race earlier that year led the general press to organize a marathon race. Pierre Giffard, editor-in-chief of the newspaper Le Petit Journal set a new madness on its feet: Paris to Brest and then back again, a distance of 1200 kilometers, without a change of bicycle. The race favourites were those riders who could assure themselves of a number of pacers, among whom was Charles Terront whose race director was Herbert Duncan, and Pierre Jiel-Laval who had eight supporting riders at his disposal. Gathering before the offices of the Petit Journal, 206 riders set off towards the Champs-Elysees. After 50 kilometers, Terront was already 5 minutes ahead, but flatted close to the town of Laval. Equipped with changeable (clincher) Michelin tires, at that time not widely known, he had to walk three kilometers to meet the firm&apos;s technicians who took three quarters of an hour to change the tire. He rejoined Laval at Vitre, and the two riders rode together through the first night. At Brest, Laval was fifteen minutes ahead of Terront, the victim of two more punctures. Corre, in third place, stopped for eight hours of sleep, with the result that the return leg resumed as a duel. At Lamballe, during the second night, still without sleep, Terront learned that his rival was resting at an inn. He made a route detour so that he would not be seen by De Civry, Laval&apos;s manager. By the time these two had learned that their adversary had passed them in the night, the race had been already lost. After 71 hours and 16 minutes without sleep, "Charley" arrived delirious in the early morning at the Port Maillot in Paris, where ten thousand spectators had been awaiting his arrival through the night. Jiel Laval passed the finishing post seven hours and forty minutes later. Coulliboeuf and Corre arrived the next day. In all, 99 riders finished within the ride's time limit of ten days. All the great names of cycling were at the start line of the second Paris - Brest - Paris. Lucien Lesna took off by himself, prompting the jeers of his rivals, particularly Hyppolyte Aucouturier. "He must have forgotten that we have to turn at Brest and return to Paris." But at Brest, embarking on the return leg, Lesna had a two hour lead on his pursuers. At Rennes, where the heat was stifling, he decided to stop for a bath. When he left again into a stiff headwind that had blown up, he was joined by Maurice Garin who had made up ground in spectacular fashion. Unrelenting in his pace, Garin began to put distance on his rival now in agony and on the point of abandonment. "The Chimney Sweep", as Garin was known, widened the time gap to finish, at the Parc des Princes, in fifty-two hours and eleven minutes, close to two hours ahead of Gaston Rivierre. After Charles Terront in 1891 and Maurice Garin in 1901, Emile Georget added his name to the glorious record of Paris - Brest - Paris. For the third edition of the ride, L'Auto, the sponsoring newspaper, decided to start the race by having the racers cross Paris at night, before a mass of spectators. At Dreux, even though Brocco had gained an advantages of a few minutes, the favourites agreed to take a short rest break. Four men - Georget, Octave Lapize, Cyrille Van Houwaert, and Ernest Paul - headed towards Brest. After riding together in a group for forty-eight hours, Paul pushed on rather than taking a rest jointly decided upon. A puncture wiped out the advantage of his lone break. Around Mortagne, Georget took off, despite his fatigue. He arrived at the Parc des Princes, the spectators in an uproar, after 50 hours and 13 minutes on the course. The opening hours of this edition of the ride began quietly. An initial breakaway of riders took place as the second night of the ride was closing in, when five riders - Christophe and the Belgians Mottiat, Sellier, Masson and Heusghem - joined later by Alavoine and Barthelmy, separated themselves from the pack. The two who had fought to join the breakaway soon abandonned despite the encouragement of their trainers. At Laval, the five members of the breakaway decided to stop and replenish themselves. Sellier, however was very tired and was soon asleep on a table. This did not prevent him from making a break when he arose the next day. Quickly, he was rejoined by Mottiat. Behind, Christophe, his legs heavy, could only survey the damage. Mottiat attacked on a hillside in Picardy, the road packed with an immense crowd of spectators who allowed only a narrow passage for the race leader. Christophe had recovered his strength, but his luck ran out. As he was gaining ground on Mottiat, he punctured near the town of St. Cyr, and rode on with a bicycle he borrowed from a spectator. Shortly before the entrance to the Parc des Princes, the chain of this new bike then broke and when Christophe saw Masson come out of nowhere, he feared his second-place finish was about to be lost. But his trainers managed to get him a racing bicycle and he made up the time gap on the four laps of the Parc des Princes velodrome to pip the Belgian in the final straightaway. Mottiat had already crossed the finish line twenty-three minutes earlier. He was carried aloft on his arrival at the finish line, his face wreathed in a peculiar smile. In fact, the winner, who had consumed a great deal of wine in the last fifty kilometers of the ride in an effort to restore himself, was drunk. The fifth Paris-Brest-Paris, organised by the Petit Journal, had a great deal of difficulty in recruiting riders. "We have better things to do than take part in a speeded-up version of a tourist event", the professionals protested. Nevertheless, twenty-eight racers lined up at the start, of whom the Luxemburger Nicolas Frantz attracted attention through his use of a two-speed derailleur. The first few hours of the ride were awful. Thunderstorms rumbled through the night, prompting the abandonment of six riders, among whom Desmuysere and Magne. After the turn at Brest, where Frantz held the lead, new retirements took place including Marcel Huot, Jef Mauclair and Benoit Faure. Emile Joly took off in the wrong direction after stopping to quench his thirst. Despite the orders of his manager, exhausted, he refused to turn around, wanting to listen to nothing. Exhaustion had destroyed his ability to think. A strategem was required to thread him into the drive of a garage where his mechanic snared him in a tent fly. Joly then slept in the team car for three solid hours. At Houdan, after fifty hours on the road, Marcel Bidot attacked taking a two minute lead before puncturing. He was then joined by four men - the Australian Hubert Opperman, the Italian Giuseppe Pancera, and the Belgians Leon Louyet and Emile Decroix. The race was played out in a sprint at the Velodrome Buffalo (in the Port Maillot). Louyet seemed the fastest but Opperman passed him in the first turn. Despite his great victory bad news was waiting for the Australian: his sponsor, the bike manufacturer Alleluia, had gone bankrupt. He was not to collect his winner's bonus. The organizers of Paris - Brest - Paris, run every ten years but interupted by the war, had a harder and harder time to convince racers of the value of the ride. The hero of the first part of the course was Benoit Faure, nicknamed "The Mouse" in the thirties, who, at 49 years old, succeeded in holding off the peloton for 540 kilometers. At the Brest turnaround, four riders - Hendrickx, Tacca, Neuville, and Fazio - looked like possible winners. Pierre Tacca made a break at Pontchartrain but a flat slowed him at Versailles. While fixing his bike he saw the Belgians Francois Neuville and Albert Hendrickx roll past. A heavy rain made the finish on the dirt track of the velodrome of the Parc des Princes impractical. An alternative on a boulevard in the Bois de Boulogne was hastily put in place. Hendrickx beat Neuville by a half-wheel after 1200 kilometers of riding. 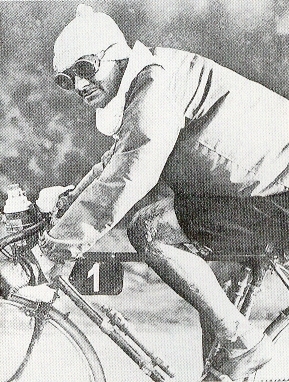 Twenty years after Opperman's victory in 1931, Marice Diot, the victor of the seventh edition of Paris - Brest - Paris covered the 1200 kilometers of the route in 38 hours 55 minutes and 45 seconds. This was ten hours faster than the earlier winner. The courageous rider Robert Chapatte had given the peloton difficulties at the race's start, taking a lead of a quarter of an hour at the Brest turnaround at the beginning of the second night. The Parisian, who was hampered by a groin injury, kept up his solitary break until, close to Morlaix, he stopped and abandonned the race after a misunderstanding with his handlers. It was at Vitre that the two favourites, Diot and Muller, began an offensive. Twenty-two kilometers from the finish, Muller flatted, but Diot waited for him because he wanted to play out the race for victory at the Parc des Princes. At the finish line, he recorded the victory by a half-wheel.